Home Blog Another Win for IOB! 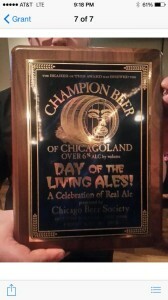 We took First Place at the Day of the Living Ales cask ale festival! There were only 2 categories (over 6% abv, and under 6% abv) and our “Abbey Obscuro” Belgian Stout with Chipotle Pepers, Coco Nibs, Cinnamon, and Vanilla Beans took first in the over 6% category. We we’re in good company, the other winners were Goose Island, Half Acre and Revolution. Cask, Competition, Day of the Living Ales. Bookmark. St. Patrick’s Day at IOB!